Your beds and mattresses can be expensive, which means that you would want to take care of them. More importantly, you would want to take good care of the people who sleep in these beds. Sometimes those two things come together—for instance, if you have a young child, a family member who is struggling with incontinence, or if you or someone who sleeps in the bed is prone to spilling things on the mattress, you could find yourself ending up with a stained mattress and an uncomfortable (and in some cases, unsafe) night. 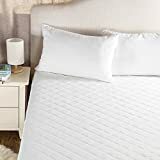 A mattress protector will be very helpful in these instances—it fits between the sheets and the mattress, and if it gets stained, it can be cleaned much more easily than the mattress itself. It is a comfortable method for protecting the bed while ensuring that the people in it have a comfortable, dignified night’s sleep. If you’re in the market for a mattress protector, here is how you can find the right one. Crib: Crib protectors are designed specifically for baby beds. They’re obviously smaller in size, and are also designed with babies’ safety in mind, for instance, leaving out materials that could present choking hazards. 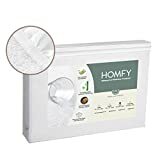 Hypoallergenic: Hypoallergenic mattress protectors are designed to help users with sensitive skin or other allergy-related problems. 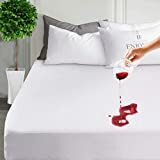 Pest control: As unpleasant as it might be to think about, dust mites, bed bugs, and other pests can find their way into mattress protectors along with other bedding items. Some protectors are specially designed to keep such pests out, for instance, by encasing the entire protector in plastic instead of having just a single layer of it on top. Durability: This is one of the most common themes in reviews. 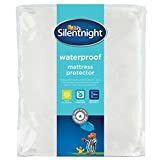 A mattress protector must be able to stand up to extended use and repeated washings or cleanings. The best brands do just that. Absorbing power: Although you don’t want to leave a stained protector in place for too long, the reality is that there will be times when it doesn’t get changed immediately after being stained. The best models are able to handle being used and still allow for the sleeper to rest in comfort before being cleaned the next morning. Comfort: Since the protector goes between the mattress and the bed sheets, it’s possible that it could make the bed less comfortable. With better models, that’s not a problem—they’re designed to be as comfortable as they are functional. Security: A protector won’t do much good if it doesn’t stay in place. Good protectors are designed to fit snugly on the mattress and keep their place until they are removed by the owner. 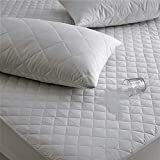 Breathability: When looking for a mattress protector, look for one that is designed to let air pass through it. That will help to keep the bed and sleeper cool, even as the protector keeps the mattress from getting stained. 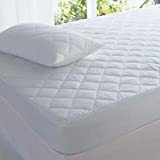 Washable and Dryable: It makes sense that all mattress protectors can be washed—some can be put directly into the washing machine—but not all of them are designed to be put into a clothes dryer. If you know that you’ll need a protector that will need to be dried quickly, be sure to look for one that is dryer-safe. 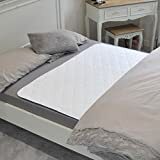 Material: If you or the person who will be sleeping in the bed has sensitive skin, be sure to check out the material that the protector is made out of, and if necessary, buy a hypoallergenic model to keep things comfortable. Fit: When shopping for a protector, be sure to check out its dimensions and pick a model that fits perfectly with the mattress for the best protection. 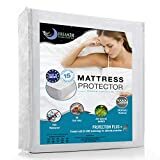 SafeRest: SafeRest is an American company that produces mattress and pillow protectors and other products designed to keep beds dry and comfortable. They also produce a line of protectors that have added protection against bed bugs and other pests. SureGuard: SureGuard produces a number of bedding protection accessories, including mattress and pillow protectors, as well as covers for box springs. Luna: Luna is an American company that produces bedding protectors, including models designed to keep bed bugs out. 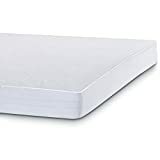 Priva: Priva is a mattress protector company that is owned by FiberLinks, which produces a wide array of bedding and other homes accessories. American Baby Company: American Baby Company is an American manufacturer of bedding products for infants, from cribs to mattress protectors.